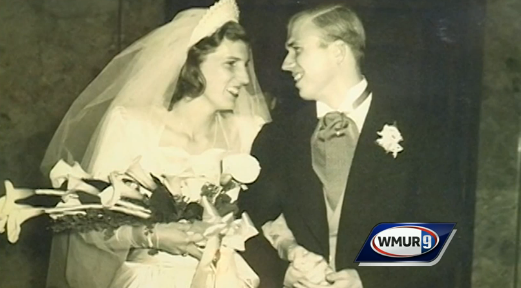 After 72 years of marriage, Peter and Mary Funk are still deeply, madly in love. “Even today when Dad walks into the room, Mom will say, ‘Ah, look at that handsome man,'" the couple's daughter, Celine Gandolfo, told New Hampshire's The Keene Sentinel. The Funks, now in their 90s, celebrated their 72nd wedding anniversary on November 25. On Thanksgiving Day, they got together with their family to commemorate the milestone. “It’s been happy for so long, we can’t believe it,” Peter told ABC affiliate WMUR9. “I’ve known her for 75 years." Mary and Peter met at a party when she was 16 years old and he was an 18-year-old student at Princeton University. They went on to have seven kids and now have 15 grandchildren and seven great-grandchildren. "I don't think we've ever had a fight," Mary said. Her daughter confirmed as much to The Huffington Post. "If it came down to a disagreement, one would do the classic 'Yes, dear' and things would work out over time," Gandolfo said. "I truly do not remember them ever yelling at each other, even through the difficult and challenging times in life. Humor and laughter have been constants and they have always enjoyed each other." For more on their lifelong love story, watch the video above and then head over to The Sentinel.